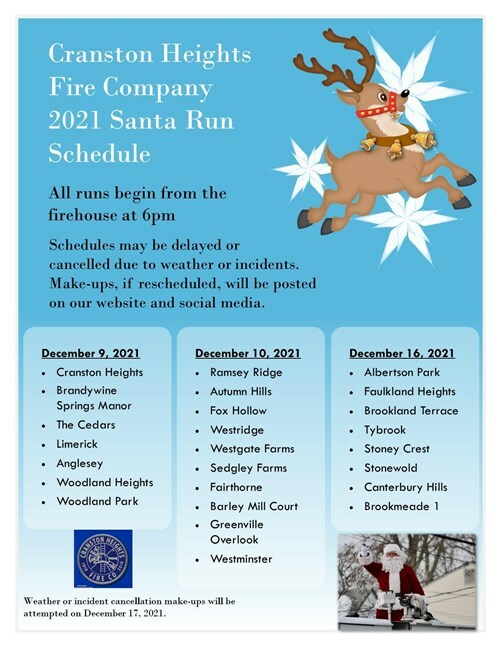 The Cranston Heights Fire Company is continuing their annual SANTA RUN in our area. Below are the developments we are visiting on specific dates. If you do not see your development, please let us know! 12/10 Albertson Park, Faulkland Heights, Spice Mill Run, and Tybrook 12/11 Brookland Terrace, Woodland Park, Stoney Crest, and Woodland Heights 12/12 Limerick, Anglesey, and Sedgley Farms 12/16 Brookmeade 1 (5pm) and Brookmeade 2 & 3 (To Follow) 12/17 Stonewold, Brook Valley, and Greenville Overlook 12/18 Cedars, Brandywine Springs, Fairway Estates, and Cranston Heights 12/19 Ramsey Ridge, Autumn Hills, Fox Hollow, and West Riding 12/20 West Minster, Westgate Farms, and Winterbury We will make every effort to reschedule any trips that need to be cancelled due to weather or emergencies. We hope to post any rescheduled dates on our website and social media.